When the wind blows in the Fens, it blows. John had to settle for outside the top-ten as Cambridge Uni riders Tony Hornbuckle and Robert English slipped in before him. 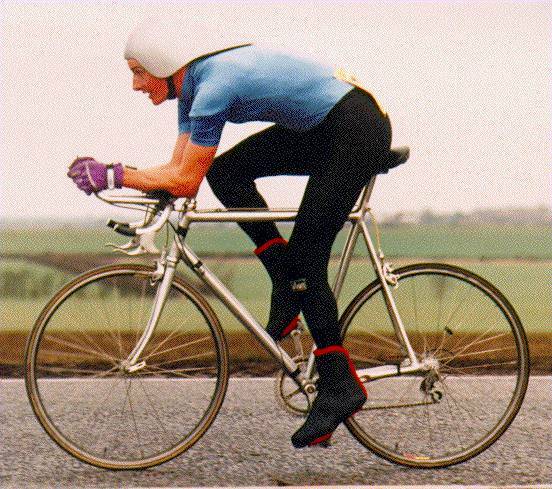 Unfortunately, the riders had to contend with cross-wind most of the way on the exposed A142, and pointy-hat wearers John and Andy experienced turbulence problems; Andy gave up when his helmet swung right over his face! Looking on the bright side, it was a good test of resilience, and hats off to Mike Hutchinson (Cambs Uni CC) with his second-place time of 57:17.